Dwight built his first bike starting in ’64 as he was being discharged from the Marine Corps, a ‘55 Panhead Chopper. Riding over 40 years, supervised the building of a touring Harley without a front fairing in ‘91. Shown in the H-D Ride in Show in Sturgis that year then Daytona. H-D introduced the Road King in ’94. Dwight worked on the first MotorClothes show in Sturgis for Karen Davidson, was a model in the Harley catalog and guest of the Davidson family for a ZZ Top Sturgis concert that year (‘91) In ’03 showed his latest, an ‘Ultra King’, a Road King with everything from the Ultra Classic except the front fairing. 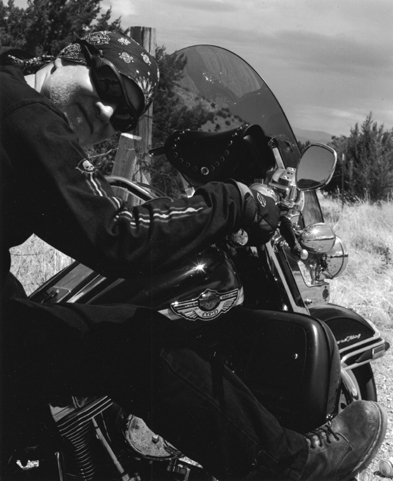 Showed at the H-D Ride in Show, Sturgis that year. Though Dwight has talked with the execs of H-D, they have yet to introduce this model. In honor of Harley-Davidson’s 100th, Dwight took the year to criss-cross the US, including, the Lincoln Hwy, Route 66, Santa Fe Trail, Lewis & Clark Trail and rallies like Daytona, Laconia, Laughlin, Sturgis, Milwaukee, over 20,000 miles. Best known in the hair industry, as instrumental in building some of the largest professional hair care companies, creating hair trends and headlining major industry hair shows worldwide.